Lying on my back on a West Village rooftop, I felt carefree and relaxed behind a newly purchased pair of wayfarer sunglasses. Earlier, I’d been parading the sidewalk with purpose while sporting a friend’s aviators and, relishing my sun-drenched nonchalance, noted how changing specs had shifted my attitude. You see, sunglasses are more than just sunblock for your eyes, they bear connotations constructed by decades of stereotyping and both influence how you see the world and how others see you. Okay, I realize there are other factors contributing to your state of mind and that sometimes you’re really just donning ray-bans to keep from squinting in the sun as you scurry the concrete grid, but bear with me. You consciously selected that pair of shades for a reason. Chances are you’re looking to emulate the celebrity don’t-look-at-me attitude with conspicuous lenses, not wanting to admit you actually take pleasure in the attention reared by your bold shades, because doing so would thwart your composure. The style is ideal for hangovers and stoners (for obvious reasons), but also let you feign confidence when feeling insecure. And, if you wear them long enough, you might just notice your feelings shift. Regardless, the statement pair connotes a brazen temper and demand respect. You want to publicly announce to the world that you will to go against the herd and command attention. A recent perusal of Urban Outfitters tells me checkered and camouflaged lenses will be scattering the hipster ‘hoods this summer. For those of you looking for a less flagrant alternative to the classic black and brown, may I suggest the mahogany stain that is wildly popular amongst high-end designers this season? 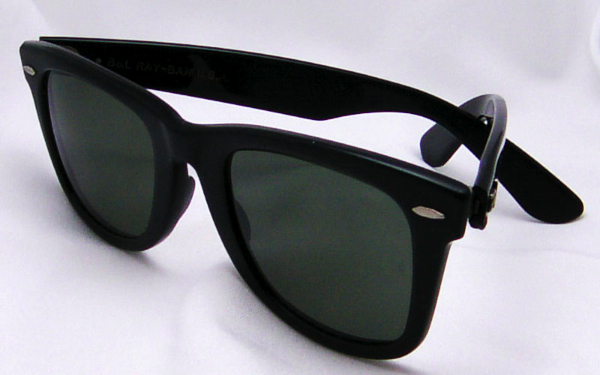 Don’t kid yourself by thinking you’ve reinvented hipsterdom by opting to replace your wayfarers. Do consider yourself mildly bold, as not just anyone can pull them off without looking ridiculous. Though selecting sunglasses based on face shape alone is boring, it must be taken into consideration. So, props to those of you who can rock this style – just don’t get too cocky. If you want to look ridiculous, imitate Sir Bryanboy, keeping in mind that you aren’t fashion savvy enough to be admired for your choice of futuristic shades (unless you’re Lady Gaga).